The provision of an inclusive environment was one of Sustainable Development Goals (SDG) 11 targets that was also listed in the declaration document of the 2016 NUA (New Urban Agenda) Habitat III. This was no exception for the public buildings and transport facilities provision that should meet and accommodate the needs of all users including persons with disabilities, the elderly, children, and women. Currently, Indonesia has committed to ratify and implement the CRPD, including the enactment of several regulations and the provision of access environment in public buildings. However, such implementation has not been maximized and complies with standards based on inclusion design. This paper is part of a Research-Based-Community Service to observe and evaluate bus stop and the pedestrian way in Surabaya. Yet, the discussion only highlights the result of pre-eliminary study of accessibility condition at bus stop based user paricpation. Methods of observation and environmental simulation were used to obtain research data. The results show various problems caused by lack of user participation and understanding and information on the design of accessible environment. This led to many application designs on the environment not in accordance with existing regulations and the needs of users especially those with special needs. Aminah, Siti. (2006). Transportasi Public dan Aksesibilitas Masyarakat Perkotaan. Journal Universitas Airlangga, 13. UU RI NOMOR 19 TAHUN 2011 (2011). Burton, E., & Mitchell, L. (2006). Inclusive Urban Design: Streets for Life: Architectural Press. Clarkson, John. (2007). Designing a more Inclusive World. Paper presented at the Universal Design for the 21st century: Irish & International Perspectives, Irish. Deardorff, Carolyn J., & Birdsong, Craig. (2003). Universal Design: Clarifying a Common Vocabulary. Housing and Society, 30(2), 20. Fletcher, Howard. (2006). The Principles of Inclusive Design. London: The Commission for Architecture and the Built Environment. Fletcher, Howard (2006). Principles of Inclusive Design (They Including You). UK: The Commission for Architecture and The Building Environment (CABE). HABITAT III: NEW URBAN AGENDA (NUA), (2016). Hayati, Arina. (2013). 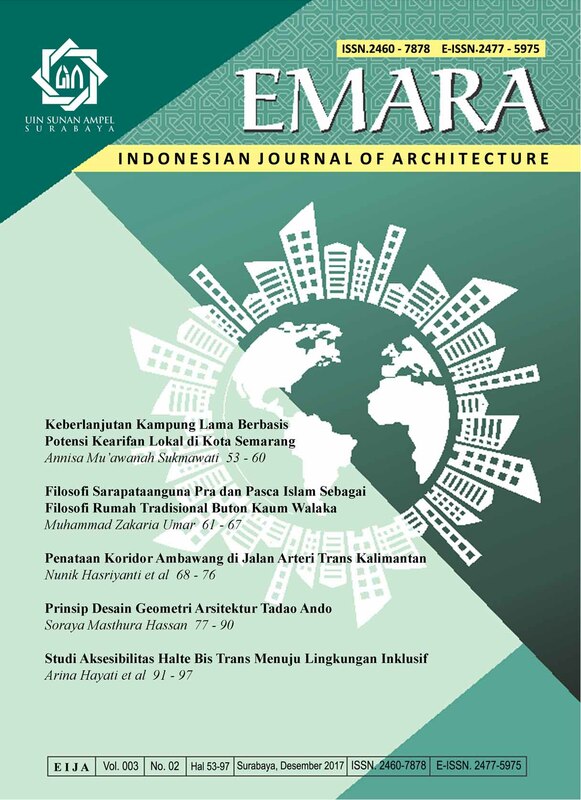 EXPERIENCING DISABLING BUILT ENVIRONMENT: Mobility Impairment in The Kampungs of Surabaya, Indonesia. (Doctorate), Institut Teknologi Sepuluh Nopember, Surabaya. Imrie, Rob, & Hall, Peter. (2001). Inclusive Design: Designing and Developing Accessible Environment (1 ed.). London: Spon Press. Langdon, P.M., Lazar, J., Heylighen, A., & Dong, H. (2014). Inclusive Designing: Joining Usability, Accessibility, and Inclusion: Springer International Publishing. London, Transport for. (2014). Accessible bus stop design guidance. London: Retrieved from www.tfl.gov.uk. PERMEN PERHUB Nomer PM 98 Tahun 2017 Tentang Penyediaan Aksesibilitas pada Pelayanan Jasa Transportasi bagi Pengguna Jasa Berkebutuhan Khusus (2017). PERMEN PU Nomor 30/PRT/M/2006 Tentang Pedoman Teknis Fasilitas dan Aksesibilitas pada bangunan Gedung dan Lingkungan (2006). Steinfeld, E., & Danford, G.S. (2013). Enabling Environments: Measuring the Impact of Environment on Disability and Rehabilitation: Springer US.